When it comes to the manufacturing of motor vehicles, it's fair to say the Brits have a rich heritage. Having designed and built some of the most iconic cars ever driven, the U.K. can rightly lay claim to a seat at the table of car industry pioneers. Ever since the late 1900s, innovations and technology that have helped shape the motor industry to become what it is today have originated from the British Isles. Rolls Royce, Aston Martin, Bentley, Jaguar and Mini are just a few of the household names to have originated from this part of the world and continue to this day as brands people aspire to own. So what have the key moments been and which individuals should we be thanking for the evolution of the motor car in Britain? Our timeline below guides you through the past 100 plus years. 1896 - John Henry Knight of Farnham, Surrey builds a four-wheeled petrol engine car. George and Frederick Lanchester build a similar vehicle in Birmingham. 1904 - Henry Royce builds his first car, a two-cylinder model. Later that year he meets aviator C.S. Rolls who agrees to sell the car in his London Showroom. They become Rolls-Royce limited in 1906. 1910 - Scottish manufacturer Argyll makes the first production car with four wheel brakes. 1919 - W.O. Bentley forms Bentley Motors limited in Cricklewood, London. The first 3-litre Bentley is delivered in 1921, the first British car described by engine capacity and not horsepower. 1922 - Jaguar Cars was founded as the Swallow Sidecar Company, who made motorcycle sidecars. The company changed names to Jaguar Cars in 1945. 1927 - William Morris takes control of Wolseley, one of the British motor industries oldest names. It joins MG to become part of Morris Motors in 1935. 1946 - Triumph Motor Company introduce the 1800, the first British car with column gear change. 1948 - Jaguar introduce the XK 120, the fastest production car ever made with a top speed of 120mph. Rover launches the Land Rover inspired by the wartime Jeep. 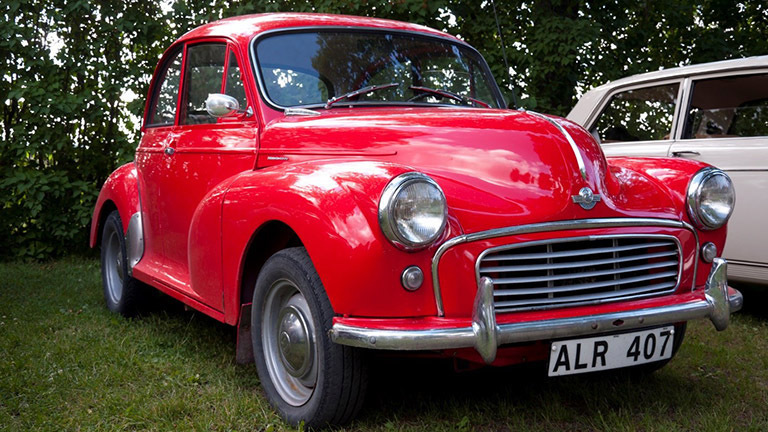 Morris launched the Minor which becomes a bestseller and remains in production to 1971. 1959 - The Mini is launched by the British Motor Corporation. 1967 - Rover, the last large scale independent car producer in the UK, is taken over by Leyland Motor Corporation. 1968 - Leyland Mortors and British Motor Corporation merge to form British Leyland Motor Corporation (BLMC). 1975 - BLMC is nationalised and becomes British Leyland Limited. 1986 - British Leyland becomes Rover Group with only the Rover and MG brands surviving. 1994 - British Aerospace, who acquired Rover in 1988, sells it to BMW. 1998 - Designed by racing car engineer Gordon Murray, the McLaren F1 becomes the world's fastest production car. 2008 - The Jaguar and Land Rover brands are sold by Ford to Indian company Tata Motors. In 2016, the British motor industry is in excellent shape despite most of the major British brands being owned by overseas companies. This is helped in no small part by some of the biggest names in the car industry having plants in the U.K., including Honda, Nissan and Toyota. In fact, 2015 was a stellar year as regards to production, with close to 1.6 million vehicles being built, over 75% of which were exported overseas. This production figure was a 10-year high, highlighting the major part Britain is still playing in the car industry worldwide.